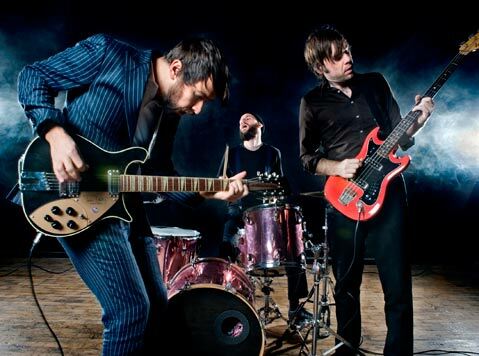 Swedish pop purveyors Peter Bjorn and John bring their latest record to life at the Santa Barbara Bowl as part of KJEE's Summer Round-Up. It was Peter Bjorn and John who penned the whistle heard round the world. And though “Young Folks” will likely remain the band’s calling card for years to come, it’s certainly done little to dissuade these Swedes from cranking out the tunes. Since breaking through with Writer’s Block in 2006, the trio has openly embraced its chameleon-like core, dabbling with everything from instrumental shoegaze (2008’s Seaside Rock) to beat-driven pop (2009’s Living Thing). In 2011, though, it was time to come full circle and return to the guitar-drum-bass foundation that they built their empire on. 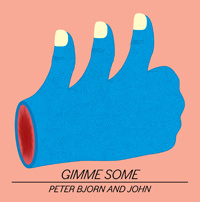 On Gimme Some, Peter Morén, Björn Yttling, and John Eriksson find themselves looking back to their hook-driven, pop rockin’ roots, delivering a record brimming with sonically upbeat, unabashedly earwormy tracks. (Listen to singles “Second Chance” and “Dig a Little Deeper,” for starters.) This Friday, PB&J return to the Santa Barbara Bowl to play KJEE’s annual summer kick-off concert. I recently spoke with frontman Peter Morén about the album, the band, and the seriousness of being Swedish. How would you compare Gimme Some to past PB&J records? I would say it’s more similar to Falling Out and the stuff we did around that period. We’ve been touring for a long time, and Gimme Some is basically based on live takes. Living Thing was a lot more cut-and-paste, and we were working with keyboards and synths and computers. This is a much more back-to-basics record. It’s not that different from Writer’s Block; it’s just a bit more energetic, a lot like our live shows, with more energy and more punk. We haven’t really managed to put that on a record before this one. Sometimes people get surprised that we’re so energetic because they’ve listened to Writer’s Block or Living Thing, and then they go see a live show and it’s like, oh, this is really different. It was great to do a record that really reflected us. For me it’s good to go back to that sound. I like it a lot. How are the shows going thus far? It’s the best record to play live. The hardest songs to get into this set list are the Living Thing tracks, but we’ve been rearranging them and making different versions to make them fit. It feels great. We try to change the set list every night. Even though we’re trying to focus on the new record, the older songs flop around a lot. After almost 10 years, what’s the secret to keeping the band together? I think part of it is all the side projects. In the middle of a tour, when you start getting tired of the other guys, you start thinking about the other projects you’re doing, whether it’s songwriting for other people or a solo record. You think about that, and it takes the pressure of the band off a little bit because you know you can go and do that in your free time. But then, when you’re doing your solo things, you start to think about the band and start missing that. And we just play really well together. We have this special chemistry that you can’t really get with just anyone. There’s something very special in it, and it would be kind of stupid to throw it away. But it’s a really up-and-down curve. Certain days you want to quit and others you want to keep it going forever. But we really enjoy playing with each other, and we have a lot left to do, I think. It’s really one day at a time, one record at a time, and right now it’s a really good period. Peter Bjorn and John play KJEE’s Summer Round-Up with Lykke Li, Foster the People, and Manchester Orchestra this Friday, June 3, at 4 p.m. Call 962-7411 or visit sbbowl.com for tickets.